This course is a flat looped course in downtown Ogden. It is on the same route as Ogden Holiday Light Parade route. 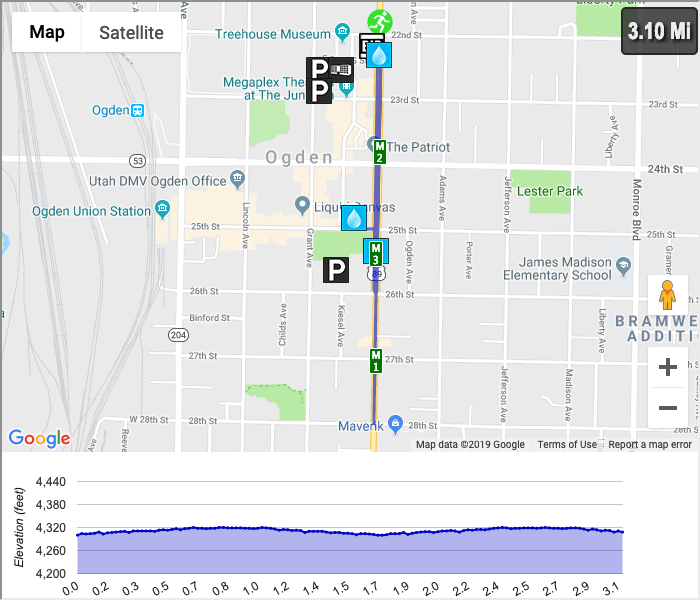 Racers start on 22nd Street in Ogden (near Ogden LDS Temple) then runners run south on Washington Blvd in the opposite lane traffic flows. Runners turn around around 28th Street and comes back up to 22nd Street running against traffic again. Racers then start the 2nd lap but on their way back from 28th Street runners head down 25th Street to finish in front of the Municipal building. Volunteers get a long sleeve elf shirt and hat to wear and are set out on the course. Generally they help out with aid stations or helping turn racers or helping at the finish line. We ask all volunteers to show up at 3:00PM and expect to help until 5:30PM. We ask all volunteers to show up to 2250 Washington Blvd in Ogden at 3:00PM. Visit the official event page for more info. How was Utah Santa Run - Ogden?